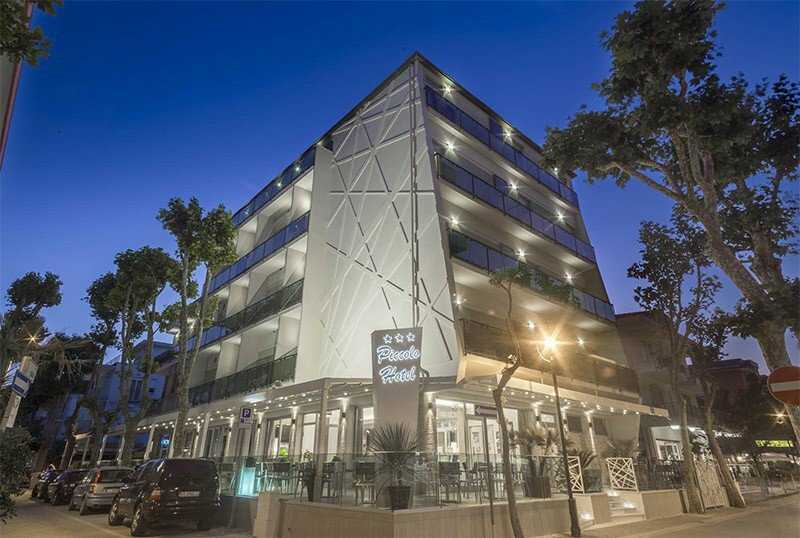 Near the beach of Igea Marina, the Piccolo Hotel is a 3-star family-run property. It has air-conditioned rooms, rooms with balconies and WI-FI connection throughout the building. Admits animals of small and medium size. This hotel adheres to the Green Booking project and has decided to donate a tree to the coast for a healthier environment and a more sustainable tourism. The hotel is located in Igea Marina, a few steps from the beach. The Igea Marina train station and the green area of the Gelso park are a 5-minute walk away. Not far from the theme park Italia in Miniatura, reachable in 15 minutes by car. COMFORT: rooms with air conditioning / heating, private bathroom with courtesy set, safe, LED TV, hairdryer, WI-FI and balcony. SUPERIOR: rooms with air conditioning / heating, private bathroom with shower and elegant courtesy set, safe, LED TV, hairdryer, minibar, WI-FI, balcony with clothesline. FAMILIES: large and comfortable rooms (about 25 square meters) are available, ideal for families or groups of friends, with a double bed and two single beds (no bunk beds). Free bicycles, terrace, hall with bar area and newspapers available, lift and luggage storage. A beach towel is available on request. Themed parties and dance evenings are organized at a partner restaurant for entertainment. PARKING: covered and uncovered, available for free subject to availability. WI-FI : throughout the entire hotel. CONVENTIONS: beach, amusement parks, discos, gym and swimming pool. On request: shuttle service and organized excursions inland. SERVICES FOR DISABLED: entrance with inclined ramp, rooms with wheelchair maneuvering space, bathroom with shower accessible. BREAKFAST: buffet with sweet and savory dishes such as brioche, yogurt, honey, chocolate, juices, coffee, cappuccino, jams, cheeses, cold cuts and eggs (on request). LUNCH AND DINNER: every day there are two menus (June and September) or three menus (July and August) based on meat and fish, a buffet of appetizers, vegetables, desserts, ice cream or fresh fruit. VARIATIONS: the menus include vegetarian dishes and, upon request, the kitchen is available to prepare gluten-free dishes. OTHER: weekly themed evenings with music and buffet with typical dishes of Romagna are organized. In the hotel: playground area with table tennis and table football, playground area for the little ones, strollers, entertainment one evening a week, evening show every week at the partner "Mito Latino". On request: pediatric counseling. In the room: camping cot and anti-fall rails. At meals: on request menu baby food with vegetable broths and vegetable soups, pre-cooked meals, warm evening milk, place mats, small glasses and high chairs. On the beach: entertainment and baby club with face painting, group dances and fun activities. The structure has an agreement with the Bagno Toni n. 87 and Bagno Marina di Levante n. 90-91, equipped with sun beds and beach umbrella, relaxation areas, entertainment, playground, baby club and sports fields. The prices of the price list are per person per day in a comfort room for a minimum stay of 3 days. ALL INCLUSIVE: Full board + Drinks with meals (water, house wine, drinks) + Beach service (1 umbrella and 2 beds per room) + Sea bag. - If the agreed departure is prevented, the Management has the possibility to apply for the Customer the compensation for three nights. From 18 May to 21 June children up to 8 years in room with 2 adults are FREE! From 22 June to 31 August children up to 2 years in a room with 2 adults are FREE!